During the Victorian Era social etiquettes were extremely important as much as social-economic status. Gentlemen and ladies alike were expected to portray the proper etiquettes at all times--basically, imbedded into the cultural appearances of the day. It was considered improper and distasteful to ignore these socially acceptable behaviors. At an early age both boys and girls were taught etiquettes of behavior and, of course, dancing. In fact, it was not uncommon for children by youthful age of 14 to know the dances of the day. The aristocracy would sometimes send their children, especially young girls, to polishing schools to learn the finer art of etiquettes. Two widely used sources of etiquettes are as follows: Civil War Etiquette Martine's Handbook and Vulgarisms in Conversation and Routledge's Etiquette for Conversation. Although today we have forgot some of these refined, gentile characteristics, we can admire and appreciate these behaviors while performing Victorian dancing or, for that matter, any dancing. One important key point for gentlemen to keep in mind were that ladies of the day were feminine, gentle, considered and admired. Gentlemen always thought of women first. For example, simple gestures like the following were accepted: “May I open the door for you?” “Please, have my seat.” “Madame, my I take your coat?” Lastly, gentlemen bows to a lady after tipping off his hat were social norms of the day. Above all, escorting the lady to and from the dance floor was good behavior. It was unthinkable to leave a lady in a dance set while the gentleman was off running to the next lady! Gentleman, remember to thank your lady before and after the dance. This shows respect and honorable characteristics. Foremost, always wear clean gloves. Extra pairs are helpful and strongly encouraged. Leaving an oily stain on a person’s clothes was simply disgraceful, not to mention, disrespectful. Both men and women need to wear gloves. For men not only does it look dashing along with fine attire but also helps reduce oily hands. Women wear different types of gloves depending on the style, length and color in regards to their clothes. Nothing looks more spectacular and glamorous with a lady in a beautiful gown with matching gloves. Ladies should refer to the gentlemen as “Mr.” and not by their first name or surname. While in public these conversations should even be shown towards her spouse. When addressing a military officer, a person should refer to him as to his rank. When in doubt, use “Mr.” (i.e., Captain Smith or Mr. Smith). 4. Look and listen to the person whom you are speaking to. While in public when a gentleman sees a lady he knows, he should tip his hat and nod a greeting to her saying: “Good day, Ma’am”, “Ma’am”, or ”Good day, Mrs. Alison.” It is then up to the lady if she desires to return the courtesy with either a nod or stopping to engage in conversation with the gentleman. A gentleman never shakes a lady’s hand in public unless she offers her hand first. If a lady has a veil drawn over her face (whether widows weeds or a fashionable traveling veil), a gentleman should respect her privacy by simply nodding, lifting his hat and walking on. If a gentleman sees a lady carrying parcels or baggage, offer to carry them for for even if she is a stranger. It will then be up to the lady if she wishes to recognize you, should you meet again. 10. Gentleman should always offer his seat for a lady. Gentleman should offer to pickup a dropped object or ask if she needs assistance. 12. Ladies should NEVER smoke in public; it is unfeminine. A lady always walks or dances to her left side of the gentleman. While walking do not link arms, but instead, the lady should rest her left hand on his right hand. A gentlemen always extends his right hand to the lady and places his left hand behind his back while escorting her to and from the dance floor. While walking in a crowded room, a gentleman should always work in front of the lady to clear her path of obstacles or to find an available chair for her. While walking on a stairways, a gentleman will walk in front of lady in order to break her fall and not to overstep on her gown. A special note to remember: If in the course of conversation, a lady repeatedly interjects the word “Sir” at the end of the sentence, she is being exceptionally reserved towards the gentleman. It is usually a sign that she does not desire his acquaintance; she is merely being polite. Information provided on this page was graciously provided by Joanne Shelby of the 9th PA Reserves of Pittsburgh with revisions by the dance master, Kurt Grauf. 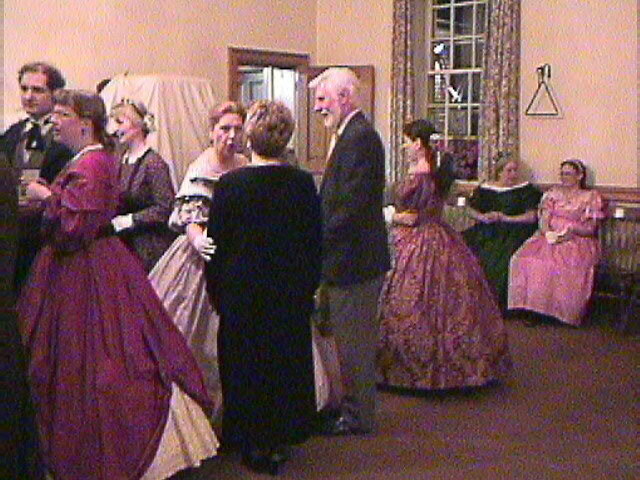 Borrowing information from this website is granted upon obtaining permission from the Civil War Dance Society. Last updated on April 24th, 2005.